As is usual, we visited Mr. and Mrs. O’Neill to talk through their plans, made suggestions for improvements and sent a full proposal with costs breakdowns and timescales. We understood that they had a strict budget so tailored the proposal to suit with a guarantee that we would not go over budget or over schedule. 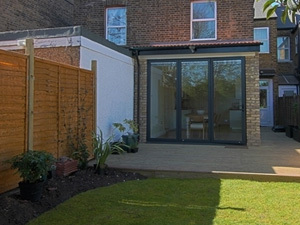 The building work in their 1960s semi-detached home was straightforward and resulted in the family having extra living space and a full aspect on their back garden with the inclusion of bi-folding doors. The project was finished a week ahead of schedule and, as promised, bang on budget.